Do you take your young kids to a daycare or nursery? These are places where we expect our children to be, at minimum, safe and nurtured. Nurseries help ensure survival and growth to a well-adjusted adulthood. It turns out that many ocean-going fish use the same strategy for their young. It has long been recognized that numerous offshore fish, including important recreational and commercial species like bluefish, flounders, snappers, and sharks, are dependent on shallow coastal bays, lagoons, and estuaries as juveniles. These shallow, protected waters offer habitats like seagrass beds, mangroves, or marshes that can shield young fish from predators and provide abundant food. Then, as fish eventually outgrow their shallow nursery habitats, they transition to offshore areas where they mix with the adult population. 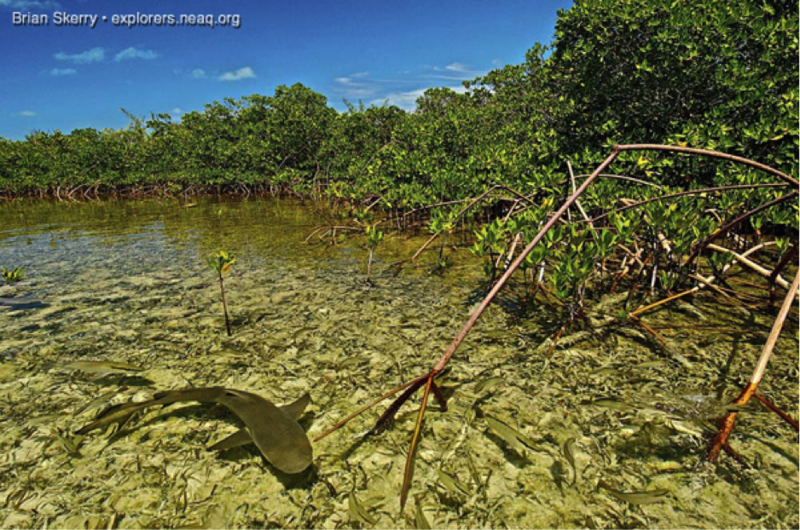 Shallow fish nursery areas, like this mangrove habitat, provide food and protection for young fish. Photo: Brian Skerry. This is why it is so troubling to hear about ongoing habitat destruction and degradation in coastal zones. Any habitat alterations that reduce the abundance of prey or take away shelter from potential predators can reduce the “nursery effect,” and may eventually reduce adult fish populations (i.e., through loss of recruits). Nearshore habitat degradation, therefore, can directly affect the offshore environment. 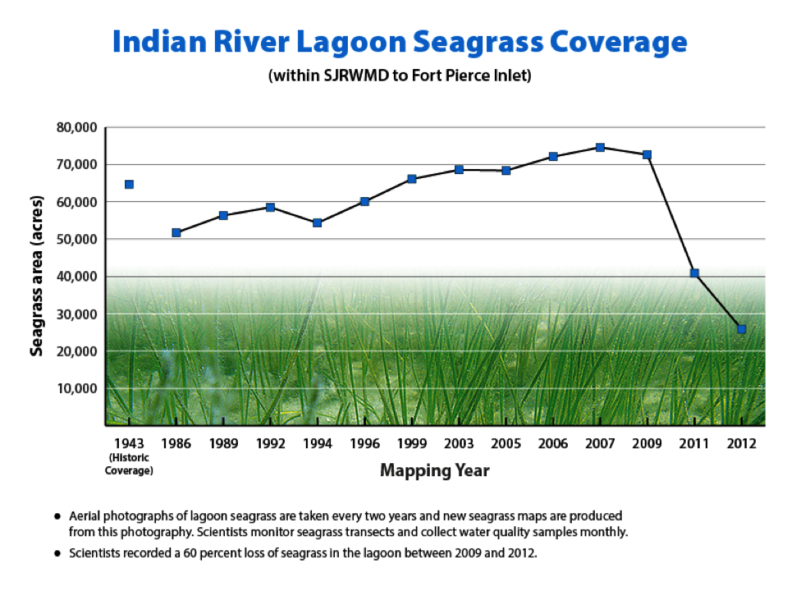 A recent example of the consequences of pollution and habitat degradation in a nursery area is the Indian River Lagoon (IRL) along Florida’s Atlantic coast. The IRL is considered the most biologically diverse estuary in North America, and is home to over 400 species of fish, many of which use the lagoon as a juvenile nursery. The lagoon is world famous for its sport fisheries for snook, red drum, spotted sea trout, and tarpon, and is a well-studied nursery area for bull sharks. Over the years, the IRL shoreline has experienced obvious habitat alterations including construction and urbanization, dredging, altered water flows, and removal of marshes, seagrass, and mangroves. These alone have reduced suitable nursery habitat. But there are also less obvious, and more insidious, sources of degradation that have come to a head in recent years. Due to years of population growth in the region, but no real upgrades in wastewater management and sewerage, the lagoon has experienced dramatic declines in water quality. This has, in turn, led to a variety of negative impacts on the IRL’s fish and wildlife. The growing additions of nutrients like nitrogen and phosphorus from fertilizers and stormwater runoff contributed to more frequent harmful algal blooms (e.g., toxic “red” and “brown tides”) which directly killed thousands of fish. In 2011, there was an unprecedented “superbloom” of algae which choked the oxygen out of the lagoon, cut off sunlight, and killed tens of thousands of acres of productive seagrass beds. Fish kills, and the deaths of hundreds of dolphins, manatees, and birds have become common in the last year. Even though it is often difficult to identify the direct causes of these deaths, years of declining water quality set the stage for these environmental catastrophes. In addition to nutrient loading, IRL fish have been documented to carry high loads of toxic contaminants like mercury, pesticides, PCBs, and flame retardant chemicals. They are also exposed to common pharmaceuticals and personal care products (e.g., prescription and non-prescription drugs, perfumes, soaps, cosmetics), which are not typically extracted by water treatment facilities. We don’t yet know if these contaminants are negatively affecting the health of these animals, but they could collectively reduce the survival rates of juvenile fish. Many people believe that overfishing is still the primary threat to the sustainability of valuable fish stocks. But we can’t rebuild depleted adult fish populations without a healthy crop of juveniles. For fish dependent upon coastal nursery areas, pollution and habitat destruction may be surpassing the negative effects of fishing in some places. These impacts need more research attention. Effective fisheries management must consider human-induced impacts on essential fish habitat, especially nursery areas. Habitat restoration, upgraded wastewater management practices, and mitigation of these various types of degradation are needed to help regions like the IRL recover. The IRL has an estimated annual value of over $3.7 billion (with a “B”) to the regional economy. Therefore, reducing our impacts on coastal habitats is not just about our appeasing our environmental conscience and rebuilding fisheries – it’s about dollars and cents, and sustaining entire coastal economies. And now it’s probably going to be much more expensive to repair the catastrophic damage done, than it would have been to take preventative measures a few years ago. Beck, MW, et al. 2001. The identification, conservation, and management of estuarine and marine nurseries for fish and invertebrates. BioScience 51:633-641. Curtis, TH, et al. 2013. 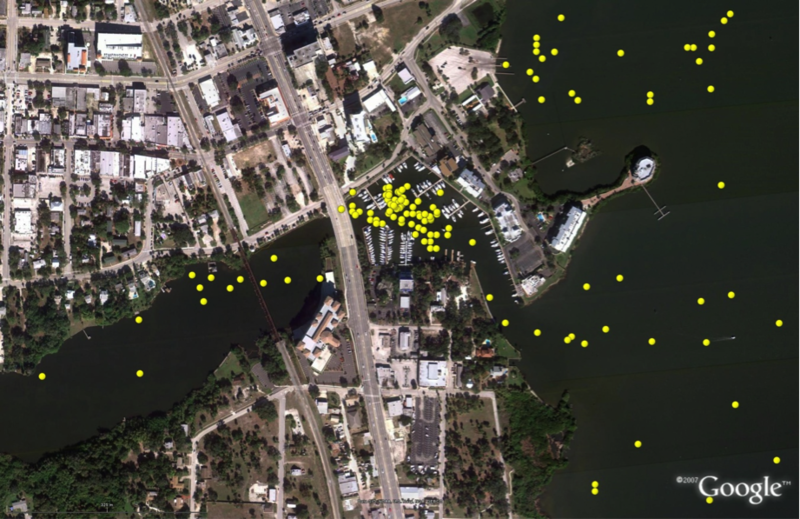 Use of human-altered habitats by bull sharks in a Florida nursery area. 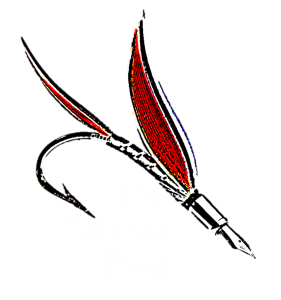 Marine and Coastal Fisheries 5:28-38. Kennish, MJ. 2002. Environmental threats and environmental future of estuaries. Environmental Conservation 29(1):78-107. Lotze, HK, et al. 2006. Depletion, degradation, and recover potential of estuaries and coastal seas. Science 312:1806-1809. 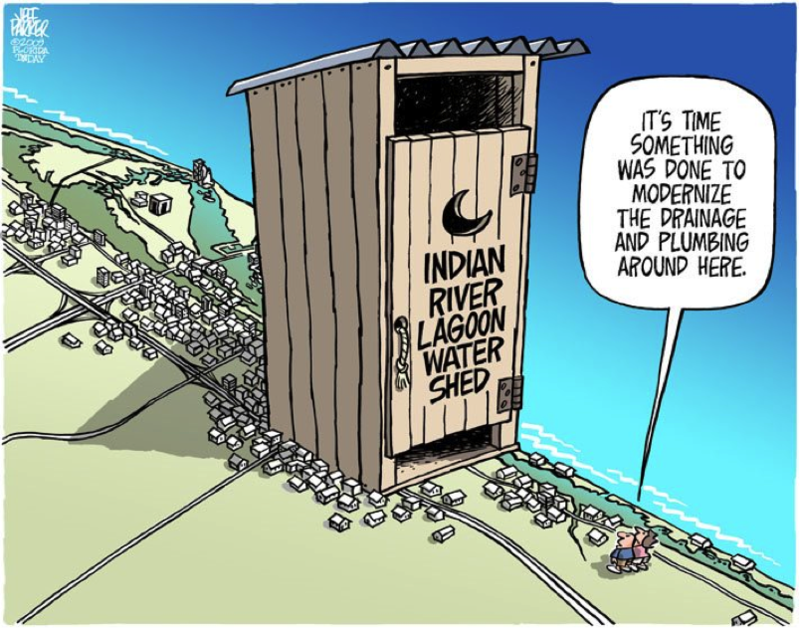 St. Johns River Water Management District: The Indian River Lagoon: An estuary in distress.